Home Non-Domain Related We Passed the $5,000 Mark! We Passed the $5,000 Mark! Riding in the Pan-Mass Challenge is one of my favorite things to do each year. 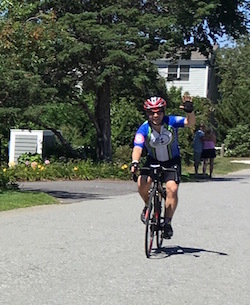 Yes, riding my bike for 163 miles over two days is challenging for me, but having raised funds for Dana-Farber Cancer Institute and the cheering spectators along the route make the ride special. The most challenging aspect of the ride for me is the training I do. I am not the most athletic person, so I train from the end of May until the end of July. For the first 2 weeks, I ride somewhere between 25-50 miles on one weekend day. For the rest of my training, I ride anywhere from 40 – 80 miles on Saturday and Sunday. This is in addition to running to stay in good health. The training rides are a challenge during the hot and humid Summer months, but it also a challenge for my wife who has to take care of the kids in the mornings. As you may know, all of the funds raised by PMC riders benefit Dana-Farber Cancer Institute, one of the world’s leading cancer research and treatment organizations. DFCI does great things for its patients, and the discoveries its researchers make help people with cancer throughout the world. My fundraising goal this year is an aggressive $12,000. This is more than I have ever raised before. So far with the help of friends, family, and particularly domain industry colleagues, we have raised just over $5,000. As a special “thank you” to my industry friends and colleagues, I have been adding the names of industry donors who are helping me reach my goal. I sincerely appreciate all of the support that has been given to me so far – it means a lot to me. I still have a long way to go to achieve my fundraising goal though. This year’s ride means more to me than ever before. My ride is dedicated to someone I have known for almost 20 years who just started chemotherapy a week ago to fight pancreatic cancer. If you are able to support my 2017 Pan-Mass Challenge ride in any way – be it a donation or even a tweet, I would be appreciative. If you are raising funds for a cause that is important to you, my wife and I are happy to support you.